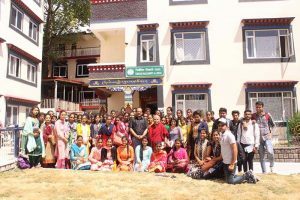 Dharamsala: Dr. Mohinder Singh Chouhan and Ms. Santosh Kumari along with 58 BA final year Political Science students from GC Nagrota Bagwan College visited Tibetan Parliament -in-Exile (TPiE) at 12:00 PM. Deputy Speaker Acharya Yeshi Phuntsok elucidated the group with his introductory session in the Parliament hall. He spoke about the increased number of self-immolation in Tibet and current deteriorating situation inside Tibet. He also spoke about former Indian politicians who have supported Tibet issue and worked for Tibetans. Deputy Speaker briefed the group about historical background of Tibet related to India and Indians, significance of Indian culture and Sanskrit in the creation of Tibetan literature, 108 volumes of Buddha’s teaching and its 225 volumes of commentaries, relation between Tibet and India and importance of Tibet’s environment being the source of fresh water for millions of people living in Asia. Deputy Speaker further spoke about the differences in the parliamentary procedures of Indian Parliament and Tibetan Parliament-in-Exile, budgets of Central Tibetan Administration and Middle way policy and its significance. 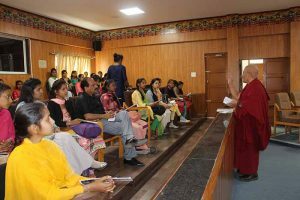 Deputy Speaker said ‘‘it’s not my choice to become a Deputy Speaker but my responsibility as a Tibetan’’ and advised students to become a good citizen not merely of India but a global citizen and also advised them to be compassionate and motivated. Finally, Deputy Speaker answered questions raised by the students and clarified their doubts.